What if Happiness Were Easy? 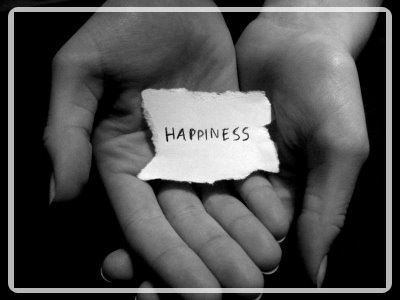 the feeling of happiness dwells in the soul." What makes you happy? A large bank account, a beautiful home, a new car? I think more books have been written on how to find happiness than any other subject! Among many other areas, we are told the secret to happiness is the perfect partner, making more money, a perfect body. While these things may give us momentary happiness, it takes a lot of time and patience to make a partnership work, riches can be gained and lost, and perfect bodies age. Democritus tells us that happiness resides in the soul. My concordance defines the soul as "that which animates man; the living being; the self." Proverbs 16:20b tells us "happy is the man who puts his trust in the Lord." 2 Corinthians 4:17b says "for the things that are seen are transient but the things that are unseen are eternal." God's Little Devotional Book tells us that "A man is rich according to what he is, not according to what he has." There's nothing wrong with making money or taking care of ourselves...just don't base your happiness on transitory possessions. Take a moment to read Jesus' words on the subject in Luke 12:16-21. God's blessings to you all in this new year.